The best time of year to plant bamboo is in the early part of spring, although in milder climates you can plant them out at any time of year. The following is a guide to planting and growing bamboos. When deciding on the position and location be aware that different species have different requirements according to sun, shade, water, weeds, and wind. Match the preferred conditions of the species to the position in the garden and the amount of time and ability you have to apply towards caring for the bamboo. With more than a thousand species and ninety one genera you can imagine that they do not all like exactly the same conditions to keep them happy or for their optimal performance! Also try to choose a site where looking after any bamboo plants is going to be easy and accessible. Larger species of bamboo grow faster and are at their best when in full sun. Some of the smaller species benefit from dappled shade during the hottest part of the day and/or protection from high winds (particularly young plants and smaller species). Although most bamboos don't need huge amounts of water to sustain, they do need to have access to water and the amount will again be dependent on the requirements of the individual species. If you want to plant bamboo in a particularly wet area of land you need to check for species that thrive on lots of water, and vice versa for a very dry climate. Note: Bamboos in containers need a slightly different watering routine. Weeds compete for water and nutrients and young plants or smaller species benefit from protection from competitive weeds at least until they have become well established. Some clumping bamboos can be planted without any fears of spreading out of their area, although remember that some species may grow into a substantially large clump. The hardiest of the clump types of bamboo that won't spread are Thamnocalamus and Fargesia. Clumping species can be planted in containers but try not to restrict the plants roots too much and re-pot when necessary. 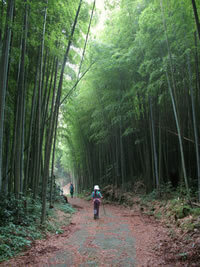 Most of the other hardy bamboos of the running bamboo species can spread through their underground rhizomes. I have sections on pruning bamboo and bamboo control and containment that provide advice about keeping the aggressive spreading species under control. Most bamboo species do their best in a loamy soil that is moderately acidic. A good soil preparation for an area where the soil is heavy is to dig in some organic matter prior to planting. Alternatively spread a couple of inches of mulch around area the bamboo and the earthworms will pull it into the soil, it's what worms do best! Having said all that, I have some bamboos that are planted in a clay type soil and they are very well established. You can plant bamboo at any time of the year in mild climates. In parts of the world that have hard winters, to enable them to survive, bamboos should be planted out early to give them enough time to get well established and harden off before the winter. If you do choose to plant bamboo later in the year, be sure to provide winter protection (see below). Use the following as a guide for the spacing needed to allow your bamboos to grow freely. It won't take long for them to get established and fill in the gaps! If you have just acquired plants in pots and can't plant them out straight away be sure to put them in a shady area and don't let them dry out until you are ready to put them in the ground. If they have been delivered with bare roots it is important to get them planted as soon as possible and make sure you don't damage any tender young shoots or fine roots. Dig your hole the same depth as the pot, or root ball, and twice the width. Mix some of the soil you have just dug out with some compost, a 50/50 mix is good. Ease the bamboo plant from its pot if it is in one, taking care not to damage and shoots or roots. While supporting your culms, gently fill the hole with the 50/50 soil/compost mix and press down so it is planted quite tightly and in the right position. Make sure the new planting does not dry out during its first summer so it can establish a good root system to support it in future years. Mulch is excellent for helping to retain moisture in the ground, 3-4 inches of bark or wood chips being ideal. If you plant bamboo species that are tall and slender it is sometimes wise to provide them with a stake so they don't get uprooted by the wind and their roots don't get damaged. This can be achieved by putting short stakes on 3-4 sides of the plants and tying a rope to the culms just to steady them until the roots have established. This need will be dependent on the species, how big the root system is, and whether it is in an exposed or sheltered location. If you imagine Bamboo plants in a forest environment as they may be in the wild, you can see that they do like to have mulch to; retain moisture in the soil, and regulate the temperature during winter or dry periods. Good mulch for bamboo plants will be something with a high level of silica and nitrogen; grass/lawn cuttings, commercial compost, well-rotted manure (not fresh), or tree chips. Fallen old leaves are fine to be left where they lay and will help with mulching. Some bamboo species are suitable to grow in containers if you don't want to plant bamboo in the ground. I like this idea as it provides a way of moving everything around in the garden now and then to create a different environment. I have several bamboos and large trees in pots! For container planting advice and tips please see my dedicated page on container bamboo. Bamboos can be propagated by lifting their rhizome shoots. This will also help with restraining the spread of running species so you get two jobs done all at the same time! This is best carried out when bamboos are actively growing, during the warm part of the year. The rhizome shoots are connected to the root ball underground and can be pretty tough to cut. Use a sharp spade, secateurs, or some loppers for this job. Try to cut close to the root ball and leave a tidy cut. Carefully dig up the young rhizome shoot and be watchful that you don't damage the roots. Once you have them out of the ground it is important not to let them dry out, I usually put them in a bucket of water temporarily. 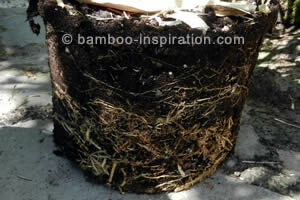 You may have already prepared your ground or pot ready to plant bamboo into. If it doesn't quite fit into the hole or container you can trim it with secateurs. Once planted be sure to water it in well. You can also shorten the top growth by up to half which will help reduce transpiration while the new plant establishes itself.